I threw the three parts to this last night and did the trimming and assembly this morning. 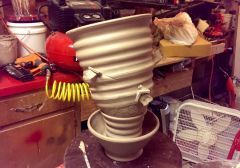 Adding the stem and tilting the container slightly off-axis reinforces the tornado theme. And based upon suggestion from CAC forum friends, I added small hand-built house parts to the side of the funnel shape. 'Still some work to do and some decisions to make about slips and underglaze, but I'm liking the direction this is headed. This will take some off-and-on work to get it ready for bisque firing...and with the assembly and the added house parts this one will set on the slow-dry shelf for a week before I'm brave enough to put it in the kiln. 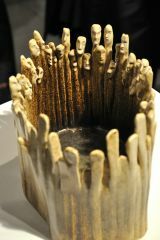 Description: 18" tall stoneware Wheel-thrown bowl, stem, and vessel...assembled while quite damp/pliable Handbuit house forms, sliced on the oblique and attached using traditional score/slip joining technique Some additional accent detail and texture added after basic assembly was complete. I slipped this container into a tall spot in the kiln at the last minute to see how my glazes break over the undulating walls. 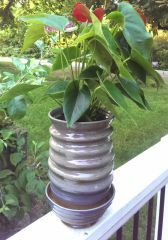 Actually, I really needed the pot for the Anthurium that I received as a birthday gift back in January...it was quite root bound and begging for better living conditions. Container is about 13" tall, stoneware, fired to cone 10 reduction and glazed with a combination of Ohio White, Woo's Blue, and Clear (sprayed on in overlapping layers).